Total cost of the project: $1.15 (plus tax)! I feel so crafty and frugal. About this anyway. 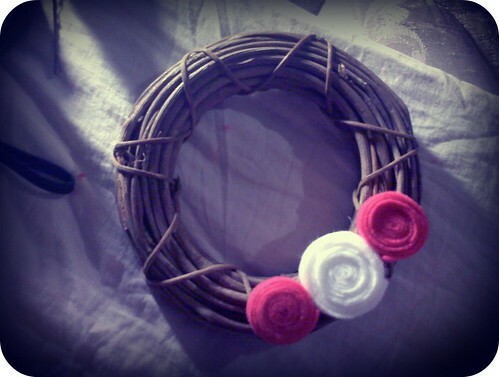 The thrift store had the cute little mini wreath with a little styrofoam block on it. I tore that thing off and added my felt swirls. Next Monday I should have more wreaths to share. Nice! And I like the site redesign, btw. thank you. every time I look at the “easy” directions for a custom theme, I change mine to a new already made free one. I like this one a lot.